As a small boutique inn, we never overbook and always reserve a room specifically for each guest. Therefore, we are greatly impacted by cancellations. Please note the information outlined below. Check-in is at 3:00pm and check-out is before 11:00am. Please estimate the check-in time on your reservation. Unfortunately, due to our small size we typically cannot accommodate early check-ins or late departures without prior arrangements. If you will be arriving after 10:00pm, please notify the front desk of your estimated time of arrival. Please use our intercom, located to the left of the front door by gate, if the night staff has momentarily stepped away from the desk to help another guest. Transient Occupancy Tax of 10% is charged on the room rate only. 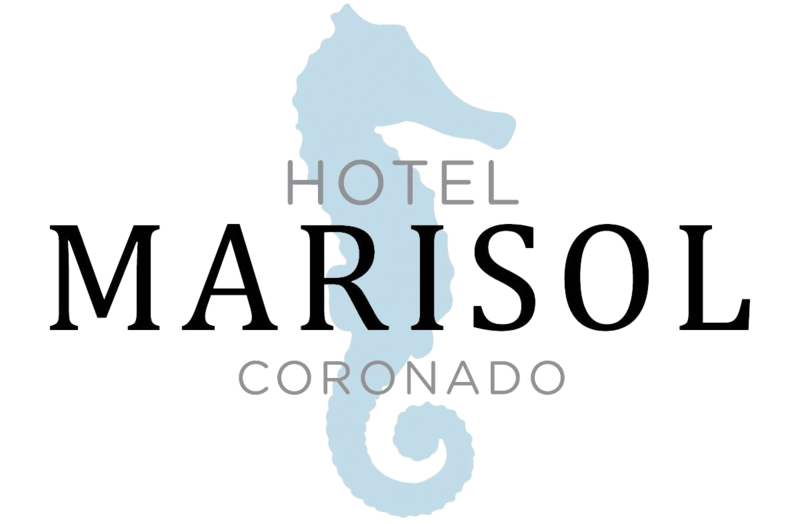 Hotel Marisol Coronado does not add any additional fees. Sales tax will be added to purchased items such as flowers or wine. To guarantee your reservation, we require a valid credit card. Unless otherwise stated at the time of reservation, a deposit of the amount of one night's stay plus 10% tax will be charged at the time of reservation. At check-in, the remaining full amount of the stay will be charged. We have a seven (7) day cancellation policy unless otherwise stated on your confirmation. For all reservations cancelled seven (7) days or more before the date of arrival there is a $25 charge. For reservations cancelled within seven (7) days of arrival, the deposit will be forfeited. Should you need to modify your reservation, please call us at least seven (7) days before your arrival date. Reservations made within seven (7) days of the arrival date are considered non-refundable and will incur charges as stated above. Our Cancellation policy is subject to change for groups or special events. A written confirmation of the cancellation policy will always be provided in the group or special event agreement. Any written confirmation will override the standard cancellation policy. If you do not cancel your reservation and do not show up, your credit card will be charged for the full amount of all reserved nights plus applicable taxes. No show reservations consisting of multiple night will be released 24 hours after the arrival date. Reservations which are made with a group booking (6 rooms or more) or during a special event or holiday period are subject to an alternate cancellation policy. This will be stated on your confirmation. If you have any questions, please contact the manager about your cancellation policy. Guests who fail to cancel their reservation which was reserved in a group booking or special holiday/event period are subject to a no-show charge equal to the amount of the entire stay. During special event/holiday periods, a minimum night stay may be required. If you have reserved a guestroom during a time period with a minimum night stay and need to cancel, depart early or fail to check-in for your reservation, please know that a full amount for the minimum night stay will be charged to your credit card. Each room can accommodate up to two people with the exception of our suites in which the maximum is four. Every Friday and Saturday requires a minimum two night stay. Hotel Marisol Coronado offers a selection of fruits, pastries, yogurt, juice, coffee and tea. No hot items will be served. Breakfast will begin at 7:00am and end at 10:00am. Enjoy a simple and delicious quick bite before a day full of activities. We are 100% smoke-free property. Please do not smoke in any of the guest rooms, on the patios or within 20 feet of the building. If smoking occurs, there will be a $200 dollar cleaning fee per night charged to your credit card. We have a specific dog friendly room that is available upon request for dogs which weigh 40 pounds or under. If you are interested in bringing your dog, advance reservations are required, as well as a non-refundable fee of $125 per stay is required. Open flamed candles are not allowed. Please do not light a candle in your guestroom. If lit, you will be liable for the entire amount of damage. Safe flame-free candles are available at the front desk should you wish to have candle lit ambiance in your room. Cash Payment is accepted; however a credit card is required to be on file. One wheelchair accessible guestroom is available. If needed, please ensure it is requested at the time of reservation. When booking your reservation please inform the front desk agent that a service dog will be accompanying you. Service animals are allowed in all guest areas. A service animal may only be classified as a dog which was trained to perform a task for a person with a disability. Under the Americans with Disabilities Act, service dogs that only provide emotional or comfort support are not qualified. Our housekeeping staff will enter daily for stayover guests (more than one night) to freshen bathrooms, empty trashcans and make the bed. If the “Do Not Disturb” sign is on the door, the housekeeping staff will not enter the room. If any additional amenities are needed, please contact the front desk staff. The hotel does not offer dedicated parking, however street parking is available. Hotel guests can use the loading zone in front of the hotel to unload/load during check-in and check-out.